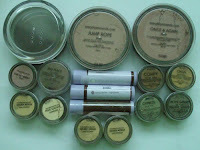 3 x olive golden medium matte foundation (sample) - so useful for touchups! as usual, now that i've gotten my loot i feel overwhelmed and know i got carried away and bought too much! will be listing for sale the pieces that i can bring myself to keep unopened, check out the list on my left sidebar and drop me a note if you're interested in any. Ahhh...i wish i had rock solid self control. I keep wavering, especially after seeing your recent haul! I also keep hoping that some of my friends might want to put in their orders, so I can put one or two things in with them! yup they've really stepped up on their shipping so i'm pretty happy with that. glad it was just website hiccups for them and not a regular occurence.